Ranger Fights Mad King Gilgamesh Over a Magic Axe & the Fate of the World. On Sale Now at Amazon, But Get Your *Free Author Swag* HERE! Ranger Nader’s an ordinary 9th grader – or so he thinks. Then, he inherits a magical axe from his Lebanese grandmother and learns he’s this generation’s “Guardian of the Cedars.” Eons ago, Gilgamesh, a sun-struck demi-god, used this very same axe to clear-cut Lebanon’s famous Cedar Forest. The resulting Great Flood nearly wiped out all life. Now, the evil king has returned to finish what he started. With the help of his sister, his cousins, and the axe of course, Ranger has to stop him. * While Supplies Last, Ebook buyers will receive two free bookmarks. 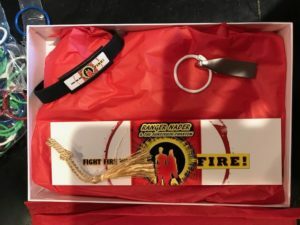 Print Book Buyers will receive two free bookmarks and a free wrist band. 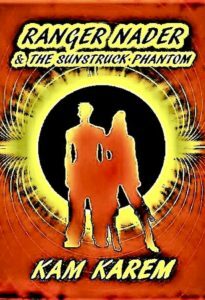 *RANGER NADER & THE SUNSTRUCK PHANTOM is a middle grade fiction book appropriate for anyone over the age of ten. With spaceships, a secret school, time travel, pirates, and an epic show-down between Ranger and crazy King Gilgamesh, its great entertainment for the whole family. The Epic of Gilgamesh was written approximately 4000 years ago and is considered to be the oldest surviving written work of literature. The Epic is about Gilgamesh, a semi-mythical Sumerian King who under takes several quests seeking fame, glory and immortality. In the Epic, Gilgamesh is reputed to be a demi-god, having been born to goddess Nnisun. On one of his quests, Gilgamesh kills the guardian of the famous holy cedar forest of Lebanon, then clear-cuts the forest. The cedar forests in Lebanon are ancient and are mentioned in Bible over 70 times. The most famous grove in the cedar forest is called “The Cedars of God,” and is located near Bsharri, Lebanon. The Cedars of God were made a world heritage site by UNESCO in 1998. The Grove has over 375 trees, some 115 feet high x 14 feet around. That is as high as an 11-story building and wider than a garage door. My family, the Karems, emigrated to the United States from “BSharri” or “Becharre,” Lebanon in the early 1900s. In BSharri, they had served with the town’s other inhabitants as “Keepers” of a grove of holy trees called “The Cedars of God.” For generations they shared responsibility for tending to these trees, which have been venerated for thousands of years and are mentioned in the Bible numerous times. 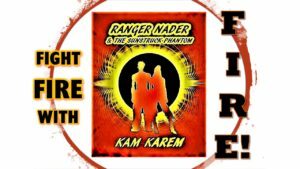 In Ranger Nader & The Sunstruck Phantom, Ranger Nader is born into a family of Keepers. When a magical axe starts chasing him, he discovers he is this generation’s “Guardian,” i.e. : person entrusted with this axe to preserve and protect God’s Holy Cedars from the ultimate threat – Gilgamesh. Lebanon’s deforestation at the hands of raiders and invaders, and its decimation due to over-use, is a matter of historic record, and has been documented for eons. The Phoenicians, Egyptians, Hebrews, Romans, Greeks, Myceneans and Ottomans all contributed to shrinking the forest to one fifth of its former glory. The clear-cutting of Lebanon’s forests has gone on for so long and has been so large in scale, it is the stuff of many legends – The Epic of Gilgamesh being one. In The Epic, 4700 years ago, Gilgamesh, who was reputed to be a demi-god with god-like powers, fought Humbaba, the guardian of the forest, for the right to use the trees to build his kingdom. When Gilgamesh won, the forest lost. In Ranger Nader & The Sunstruck Phantom, Gilgamesh is sun-struck, or insane with power, and resurfaces in today’s world where he intends to finish what he started – Earth’s destruction. Ranger confronts the crazy king with his magic axe in an epic show down. In some respects, you can say Ranger is a stand-in for my family and Gilgamesh represents those who squander our heritage because they can. In reality, they both represent all of us. Everyone who lives and breathes, and has lived and breathed, has a shared responsibility to stand-up for our planet and take positive steps to insure its resources are not squandered and instead are preserved where they can be. Read more below about how Lebanon is taking positive steps to protect its rich horticultural treasures, and how you can help! The most famous grove, called “The Cedars of God,” is located near Bsharri, Lebanon. Ranger Nader is set in Bsharri, Lebanon. The Cedars of God are endangered by over-cultivation and the lack of snow. A Cedar tree is the central image of Lebanese national flag. While to date they have planted hundreds of thousands of trees, they are over 38 million away from reaching their goal to restore the forest. October/November 2018, TK’s published her Middle Grade Book, Ranger Nader & The Sunstruck Phantom. The book will be rolled out in a slow launch in different formats and at different locations. TK published the book under the pseudonym “Kam Karem” to honor her great grandmother, Kamilla Karem. “My family, the Karems, were “keepers of the Cedars of God” in Bsharri, Lebanon, where for generations they shared responsibility for tending to the holy grove of trees with other residents of their town. My direct family left Bsharri in the 1900’s as part of the large migration fleeing taxation and persecution by the Ottomans. Ranger Nader’s an ordinary 9th grader; or so he thinks. Then, he inherits a magical axe from his Lebanese grandmother and learns he’s this generation’s “Guardian of the Cedars.” Eons ago, Gilgamesh, a sun-struck demi-god, used this very same axe to clear-cut Lebanon’s famous Cedar Forest. The resulting Great Flood nearly wiped out all life. Now, the evil king has returned to finish what he started. With the help of his sister, two cousins, and the axe of course, Ranger has to stop him. 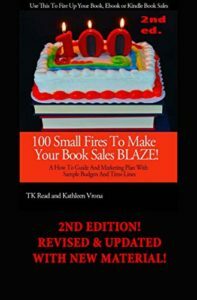 TK also co-authored 100 Small Fires To Make Your Book Sales BLAZE! 100 Small Fires to Make Your Book Sales BLAZE is a marketing guide and how-to book for writers with budgets, timelines and plans. For more information on 100 Small Fires, check out its’ blog at www.100smallfires.com. TK Read works by day as an attorney and mediator at The Read Law Firm, P.C. She’s the mother of three and uses her young adults as background research for her books. In the wee hours of the morning before the rush of the day, she downs coffee and chocolate and writes Romances books, young adult thrillers and middle grade fantasies. A life-long student, she also signs up for just about every class she can fit in her schedule – that way when her college kids gripe about their coursework, she can match them moan for moan. When she’s not writing, she’s reading all the fiction she can load onto her Kindle, running slowly for miles and miles, painting portraits, and messing around in the dark alleys and back streets of the Net. The next time your computer crashes while you’re watching a YouTube video, you might want to blame her. Here’s what she’s got out you can find on Amazon and other book outlets.